Rubenerd: Could KDE 4.4 be enough to win me back? Could KDE 4.4 be enough to win me back? While I was quick to point out the release of Apple's Aperture 3 software, perhaps even bigger news is KDE 4.4 now available. Time to check out openSUSE or Mandriva again soon? 9th February, 2010. Today KDE announces the immediate availability of the KDE Software Compilation 4.4, “Caikaku”, bringing an innovative collection of applications to Free Software users. Major new technologies have been introduced, including social networking and online collaboration features, a new netbook-oriented interface and infrastructural innovations such as the KAuth authentication framework. According to KDE’s bug-tracking system, 7293 bugs have been fixed and 1433 new feature requests were implemented. The KDE community would like to thank everybody who has helped to make this release possible. 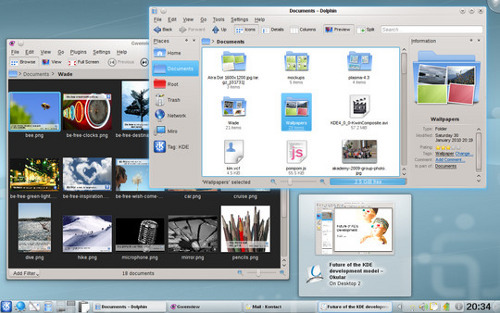 If you look through the archives here you'd see even as late as 2008 I was a huge fan of KDE and preferred it to Gnome. Qt rocks GTK's socks, and the applications that came even with the kde_base FreeBSD port felt more complete and mature than anything on competing desktops. KDE felt professional. When KDE 4.0 was released many people switched because of stability concerns and a lack of features, I hurriedly switched to Gnome. Then Microsoft shamelessly copied it for Windows 7, go figure. I've tried each release of KDE 4 since, but I've gone back to Gnome each time because at some point Gnome became fairly usable, simple to use and polished whereas KDE feels as though they're competing on glitz and wow to the detriment of consistency and usability. Apple still seems to be the only tech outfit that can create stunningly beautiful user interfaces that are also a pleasure to use. Gnome is like Google in that the interface is plain but very functional. The good news is many of the new features like the desktop widgets can be disabled and the new KDE menu can be configured to work like the menus in KDE 3.x (or Gnome) amongst other things, but it bothers me how much work I need to put in to get a desktop I feel I can use. Of course all this is my own opinion and there are plenty of people who are really happy with KDE 4.x. I'm hoping the 4.4 release might give me enough reason to move back; Gnome has the better interface but as I said I prefer Qt and Mono's encroachment worry me. Plus I'd love to start using the KDE developer tools again, KDevelop is so much fun to use it's almost criminal.